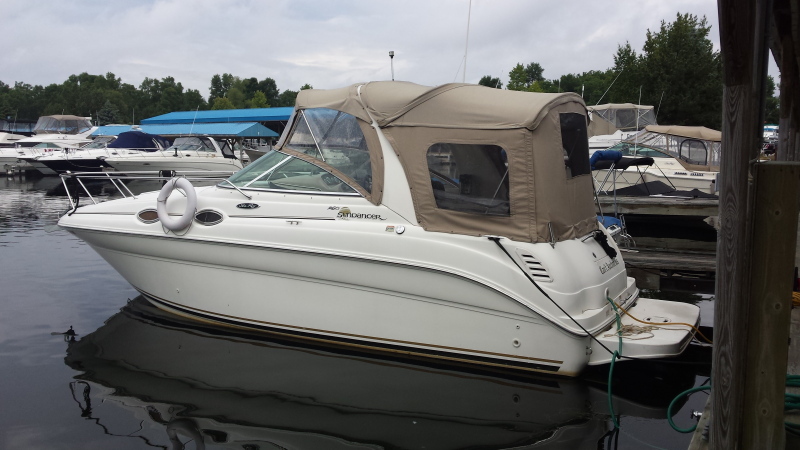 A heated and air conditioned beauty with reverse radar arch and large swim platform. Full camper back & mooring cover, transom locker, full galley and head with Vacuflush toilet and shower. The beautiful rosewood dinette converts to large V-berth, while the mid cabin aft adds a second double berth. Powered by a Mercruiser 350 Mag with Bravo III duo prop outdrive with approximately 280 hours. Comes complete with premium lines, bumpers, shore power cord and all safety equipment. Options include AM/ FM/CD stereo with helm control, CO detector, halon, Garmin GPS with sonar, depth finder and battery switch.